Since arriving here as a heifer calf, Bonita has been getting it done right from the start. A real pleasure to work with, she consistently calves early on 1st service, and produces great calves. 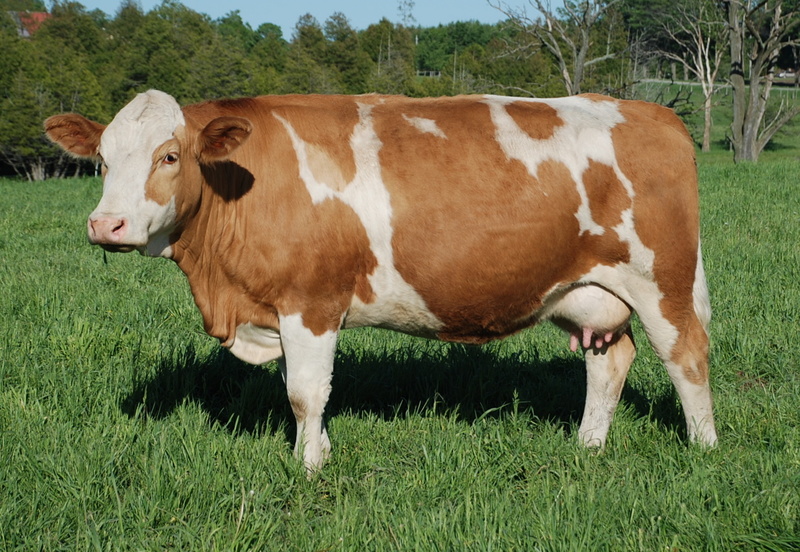 Bonita is the combination of our Ms Western 2Y and King Arthur line and then you add the outcross Saro bull, and out of a daughter ([GPCC Heidi) of the ledgendary Hackenberg sire – what a combination! Year after year, Bonita’s calves go into our development pen. They include Equinox, our present herd sire, as well as Enclave who went to Mark Jones, in Indiana and Galaxy who went to Robert Faulkaer. Her only daughter is going to go to work at Kulyk Simmentals, SK. In December, she once again started the Dora Lee calving year off with a set of twin bulls. I would have to think that perhaps Bonita is at this point in time our most productive female here at Dora Lee.